This is the class for nodes presenting operators used in an evaluation trees. Definition at line 30 of file CEvaluationNodeCall.h. Definition at line 36 of file CEvaluationNodeCall.h. Definition at line 28 of file CEvaluationNodeCall.cpp. Definition at line 39 of file CEvaluationNodeCall.cpp. References EXPRESSION, fatalError, FUNCTION, CEvaluationNode::isKeyword(), CCopasiNode< std::string >::mData, CEvaluationNode::mPrecedence, mQuotesRequired, PRECEDENCE_FUNCTION, quote(), setData(), and unQuote(). Definition at line 78 of file CEvaluationNodeCall.cpp. References buildParameters(), mCallNodes, and mpCallParameters. Definition at line 89 of file CEvaluationNodeCall.cpp. Reimplemented from CCopasiNode< std::string >. Definition at line 465 of file CEvaluationNodeCall.cpp. References CCopasiNode< _Data >::addChild(), and mCallNodes. Referenced by SBMLImporter::createCReactionFromReaction(), CSBMLExporter::createKineticExpression(), CEvaluationNodeNormalizer::normalizeCEvaluationNodeCall(), and test_compare_utilities::test_copasi_function_expansion(). Build the list of call parameters which correspond to the list of call nodes. Definition at line 503 of file CEvaluationNodeCall.cpp. Referenced by CEvaluationNodeCall(), and compile(). Definition at line 91 of file CEvaluationNodeCall.cpp. References CExpression::calcValue(), CFunction::calcValue(), EXPRESSION, FUNCTION, mpCallParameters, mpExpression, mpFunction, CEvaluationNode::mType, and CEvaluationNode::mValue. Definition at line 196 of file CEvaluationNodeCall.cpp. References CEvaluationTree::calls(), CFunctionDB::findFunction(), CCopasiRootContainer::getFunctionList(), and CCopasiNode< std::string >::mData. Clear the list of call parameters. Definition at line 524 of file CEvaluationNodeCall.cpp. Definition at line 109 of file CEvaluationNodeCall.cpp. References buildParameters(), CEvaluationNode::CALL, clearParameters(), CExpression::compile(), EXPRESSION, CFunctionDB::findFunction(), FUNCTION, CCopasiObject::getCN(), CCopasiRootContainer::getFunctionList(), CCopasiContainer::getObject(), CCopasiRootContainer::getRoot(), CFunction::getVariables(), mCallNodes, CCopasiNode< std::string >::mData, mpCallParameters, mpExpression, mpFunction, mRegisteredFunctionCN, CEvaluationNode::mType, and verifyParameters(). 161 // between that and an expression. Definition at line 427 of file CEvaluationNodeCall.cpp. References CEvaluationNode::addChildren(), CEvaluationNodeCall(), FUNCTION, and CEvaluationNode::subType(). Definition at line 393 of file CEvaluationNodeCall.cpp. References CCopasiNode< std::string >::mData, mQuotesRequired, and quote(). Definition at line 567 of file CEvaluationNodeCall.cpp. References EXPRESSION, CFunctionDB::findFunction(), FUNCTION, CCopasiRootContainer::getFunctionList(), CCopasiNode< std::string >::mData, and CEvaluationNode::mType. Referenced by CMathTrigger::compileFUNCTION(), CMathContainer::copyBranch(), CFunctionAnalyzer::evaluateNode(), CODEExporter::exportExpression(), isBoolean(), test000042::test_hasOnlySubstanceUnits(), and test000043::test_hasOnlySubstanceUnits(). Definition at line 345 of file CEvaluationNodeCall.cpp. References EXPRESSION, FUNCTION, getData(), CCopasiNode< std::string >::mData, mQuotesRequired, CEvaluationNode::mType, and quote(). Retrieve the value of the node. Definition at line 209 of file CEvaluationNodeCall.cpp. References CCopasiObject::getObjectName(), CEvaluationNode::isKeyword(), CCopasiNode< std::string >::mData, mpExpression, mpFunction, mQuotesRequired, quote(), and unQuote(). Referenced by expand_function_call(), getCCodeString(), getInfix(), getMMLString(), CEvaluationNodeNormalizer::normalizeCEvaluationNodeCall(), test000043::test_hasOnlySubstanceUnits(), test000042::test_hasOnlySubstanceUnits(), test000075::test_import_time_dependent_function_definition(), test000078::test_l2v4_import_unordered_functions(), and toAST(). 212 // that the original infix is correct. Definition at line 305 of file CEvaluationNodeCall.cpp. References EXPRESSION, FUNCTION, CCopasiNode< std::string >::mData, mQuotesRequired, CEvaluationNode::mType, and quote(). Definition at line 262 of file CEvaluationNodeCall.cpp. References EXPRESSION, FUNCTION, getData(), mQuotesRequired, CEvaluationNode::mType, and quote(). 266 //We use getData instead of mData since getData also detects whether quoting is needed. Definition at line 188 of file CEvaluationNodeCall.h. Referenced by CFunctionAnalyzer::evaluateNode(), and CEvaluationNodeNormalizer::normalizeCEvaluationNodeCall(). Definition at line 583 of file CEvaluationNodeCall.cpp. References EXPRESSION, CMathMl::fixName(), FUNCTION, getData(), mpFunction, mQuotesRequired, CEvaluationNode::mType, quote(), and CFunction::writeMathML(). Definition at line 410 of file CEvaluationNodeCall.cpp. Definition at line 665 of file CEvaluationNodeCall.cpp. Definition at line 661 of file CEvaluationNodeCall.cpp. Definition at line 490 of file CEvaluationNodeCall.cpp. References mCallNodes, and CCopasiNode< _Data >::removeChild(). Definition at line 658 of file CEvaluationNodeCall.cpp. Definition at line 241 of file CEvaluationNodeCall.cpp. 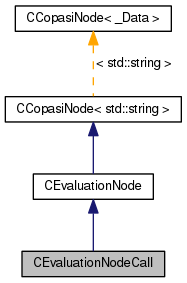 References CEvaluationNode::isKeyword(), CCopasiNode< std::string >::mData, mQuotesRequired, mRegisteredFunctionCN, quote(), and unQuote(). Create a new ASTNode corresponding to this choice node. Definition at line 441 of file CEvaluationNodeCall.cpp. References CCopasiNode< _Data >::addChild(), fatalError, CFunctionDB::findFunction(), CCopasiNode< std::string >::getChild(), getData(), CCopasiRootContainer::getFunctionList(), CFunction::getSBMLId(), CCopasiNode< _Data >::getSibling(), and CEvaluationNode::toAST(). Verifies that the parameters match the function parameters. Definition at line 546 of file CEvaluationNodeCall.cpp. References CEvaluationNode::getType(), CFunctionParameters::size(), CEvaluationNode::type(), CEvaluationNode::VECTOR, and CFunctionParameter::VFLOAT64. Definition at line 240 of file CEvaluationNodeCall.h. Referenced by isBooleanRequired(), and setBooleanRequired(). Definition at line 237 of file CEvaluationNodeCall.h. Referenced by addChild(), CEvaluationNodeCall(), compile(), getListOfChildNodes(), and removeChild(). Definition at line 238 of file CEvaluationNodeCall.h. Referenced by calculate(), CEvaluationNodeCall(), and compile(). Definition at line 236 of file CEvaluationNodeCall.h. Referenced by calculate(), compile(), and getData(). Definition at line 235 of file CEvaluationNodeCall.h. Referenced by calculate(), compile(), getData(), and getMMLString(). Definition at line 239 of file CEvaluationNodeCall.h. Referenced by CEvaluationNodeCall(), getBerkeleyMadonnaString(), getCCodeString(), getData(), getDisplayString(), getInfix(), getMMLString(), getXPPString(), and setData(). The registered object name to track eventual renaming. Definition at line 245 of file CEvaluationNodeCall.h. Referenced by compile(), and setData().